At a meeting in Hudson Wednesday evening, July16, Columbia County Democrats unanimously endorsed Anne Rubin for New York's 103rd Assembly District. Columbia County voted for Democrat Virginia Martin in 2006, and Democrats made significant gains across the County in 2007. 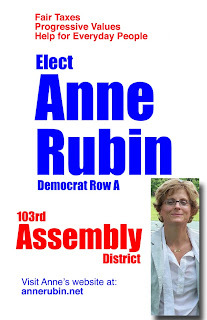 While speaking to assembled Democrats, Anne Rubin stated, "As a mother of two, I look around and I see that we can be doing more, and must be doing more, to make sure that our residents, farms, and small businesses, are not paying an unfair amount of their income to property taxes." The motion was made by Victor Mendolia, Chairman of the Hudson City Democratic Committee, who said afterwards, "We are extremely enthusiastic about Anne. Her great showing with petitions, garnering over 1000 signatures in just over a week, shows that she has a lot of momentum right now. There is tremendous grassroots excitement about her and people really appreciate that she is involved in her community, She is somebody who really understands the issues and cares about the people of the Hudson Valley". For more information, contact Pat Kelly at 845-325-2659 or patkelly@annerubin.net.